Wow. It’s been a full 12 months. Time sure flies!! This month features my absolute favorite stamp set that was released last year… Endless Wishes. WHICH, I AM HAPPY TO ANNOUNCE, IS AVAILABLE THIS YEAR AS WELL!! It’s such an easy set to use! and, even though the images are snowflakes, I’m learning you don’t have to do them in traditional snowflake colors. Which is fortunate, cause it does seem strange doing snowflakes when the outside temperature is a frigid 80. The other thing I like about this stamp set is the choice of words that come with it. There are many greeting type words that come in a mix of the cursive and typewritten fonts. They work VERY well on tags or other small items–independently of the snowflakes. So, it is a great Christmas Set investment. Now, if you know me, you know that I typically sell all my retired sets. My stampin’ space just doesn’t allow for me to keep every stamp set that I’ve ever had. But, I can honestly say, this is one set I will probably hang on to. Yes. I like it THAT much. December means it’s that time to start thinking about next year… and a new calendar! 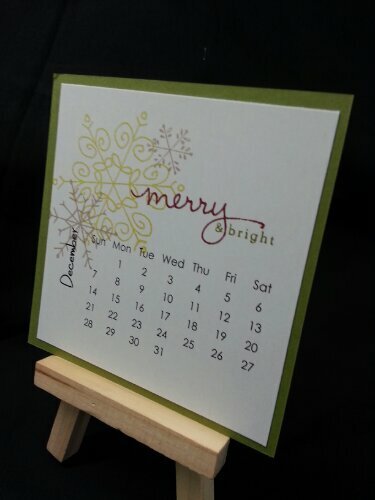 So… stay tuned to the blog… I will announce when I will have my annual Easel Calendar Class so you can come and make your own set of beautiful calendar pages… AND, we will feature them again on the first of every month next year as well!! Thanks for checking in!! Head over to see what Anne and Cheryl have for you!